Current Promotions - Get These Hot Deals! Save big on sports gear with these hot deals and coupon codes! Save 15% on Soccer Gear. Save up to 60%. Hundreds of items reduced. While supplies last. 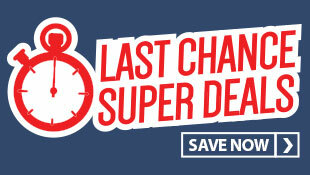 Get incredible savings in our Last Chance Super Deals sale. Save 10% when you spend $50 or more. Save 15% when you spend $500+ or more. SAVE 10% and get Free Shipping when ordering 6 or more NFHS/NCAA Balls. Get a Free Coaching Board when you spend $250 or more. Get Free Shipping on 20+ Cases - AND - Get Free Shipping on 72+ Cases + a Free Paint Liner. Buy 11, Get 1 Free on select Molten Volleyballs. And Buy 10, Get 2 Free on the Molten IVU L2 NFHS Women's Volleyball. Save 10% + get Free Shipping on orders of 5 or more Rip-It Softball Batting Helmets. Save 10% on Baseball Batting Helmets and Softball Batting Helmets. Save 10% + get Free Shipping on orders of 6 or more Batting Helmets.